Browsing for showcase fixtures by color refines the shopping experience by weeding out all the other displays of an unwanted color. The technique allows for easier scanning of our products and places the emphasis on the specific models at hand. Two types of offerings are available: single components or pre-designed layouts (that include up to 19 separate pieces) in five finishes- black, white, silver, cherry, and maple. The multiple-component counter solutions can include a number of rectangular showcases coupled with corner units and register stands. 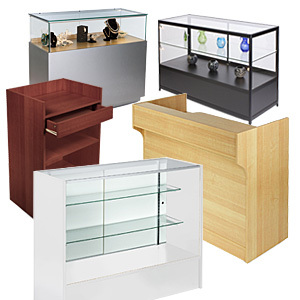 The showcases themselves come in a few different iterations, featuring one or two glass shelves that highlight merchandise or solid-faced counters used more for customer service. The pre-designed configurations are usually intended to wrap around a salesperson or team with the customers on the outside. Creating a sort of command center, employees perform customer transactions while staying visible and accessible if a shopper needs assistance. Separate components, on the other hand, can be purchased individually or in combination with other fixtures for those wishing to design their own cash wrap layout.